It’s back, it’s back! Vistaprint has a Groupon deal out right now. For $17, you can purchase $70 worth of stationery. 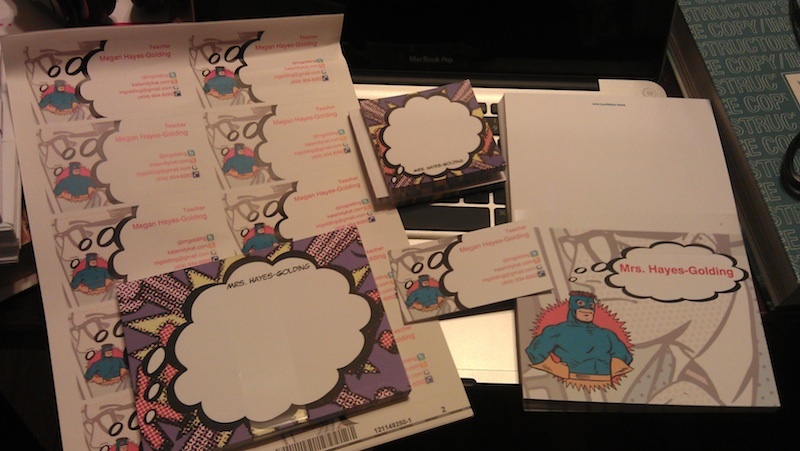 Last summer, I bought cards, Post It notes, business cards, and stickers. All of them have been useful and I’m definitely ordering more. You should, too! The notecards have come in handy many times — thank you notes to students, to colleagues, and even parents. Def my favorite part of the purchase. My business cards are straightforward and have my contact information. I purposely left off all mention of my school so I can use them in my personal and professional lives. It’s got my Gmail address, phone number, Twitter ID, and website address. Because this teacher doesn’t use business cards all that often, I’ve also taken to using them as excuse notes to colleagues when I must hold a student late after class. The Post It notes and big stickers were whim purchases (because, hey, with $70 to spend, why not?!). The big sticker is a copy of my business card. I imagined needing to label stuff like maybe a binder or a laptop power plug. Yeah, haven’t needed as much of that as I thought. Post Its have been handy, though. Sam did a far more creative job than me with his stationery discount last year, so def check his post out for amazing ideas. Also, Kate has written about writing good news postcards to her kids. UPDATE: Breedeen also made creative cards & stickers. Here’s an example of Sam’s creative card-making. Thoughts as I wrote this quick post: I keep saying to myself “stationery with an -ery means stuff you write letters on and stationary with an -ary means not moving.” I have a certain anxiety over misspelling words on a blog other teachers will read. My consolation is that most of y’all teach math and science and likely wouldn’t even notice, let alone get all up-in-arms about it.